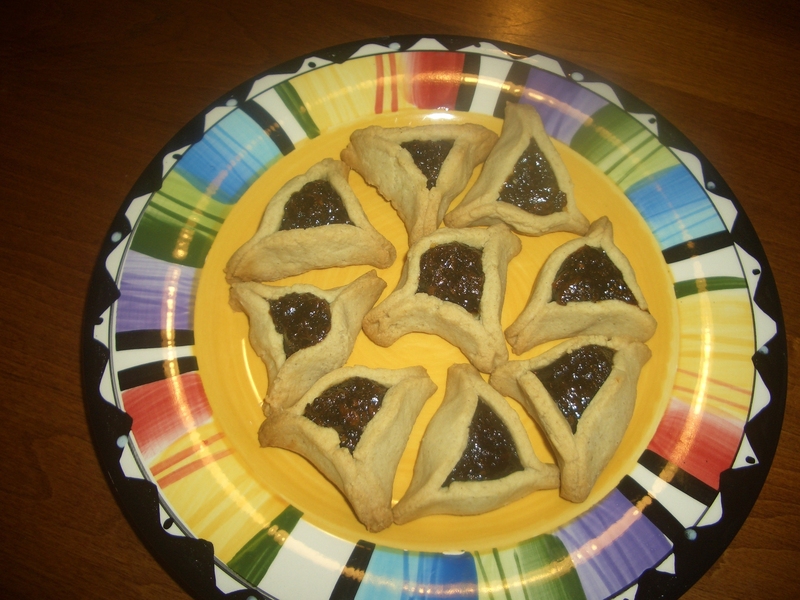 It’s Purim so it’s Hamantashen Time (to learn more see the original hamantashen post). Last year’s were really good but the dough did have a hint of coconut (not a bad thing) and I wondered if I could make them with a more neutral flavored fat. I recently purchased organic shortening; I practically never use shortening in my cooking but I have fond memories of my friend Suzy’s mom, Rose, baking brownies with shortening and frying French fries in it. Both tasted great. 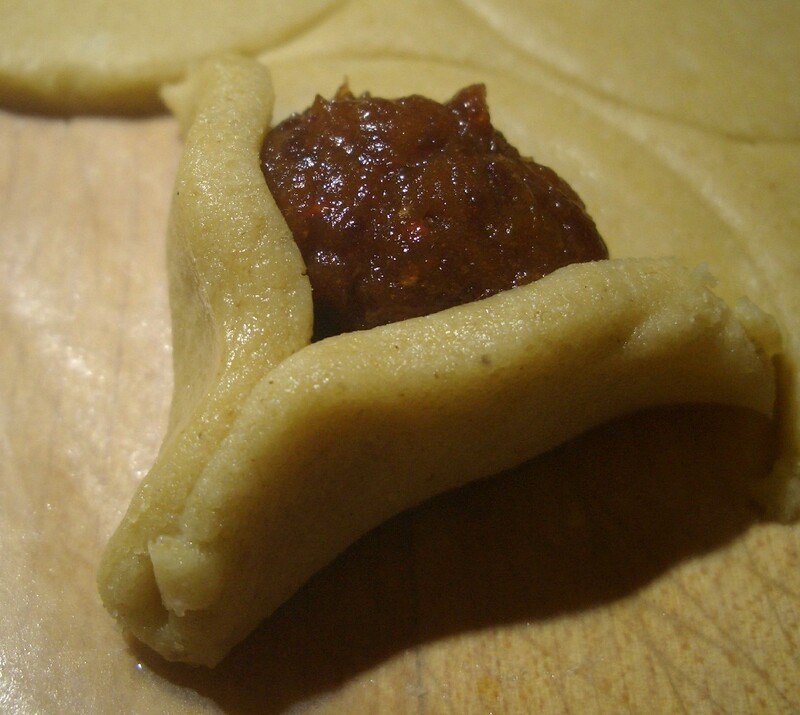 So, this year I made my hamantashen dough using the shortening. 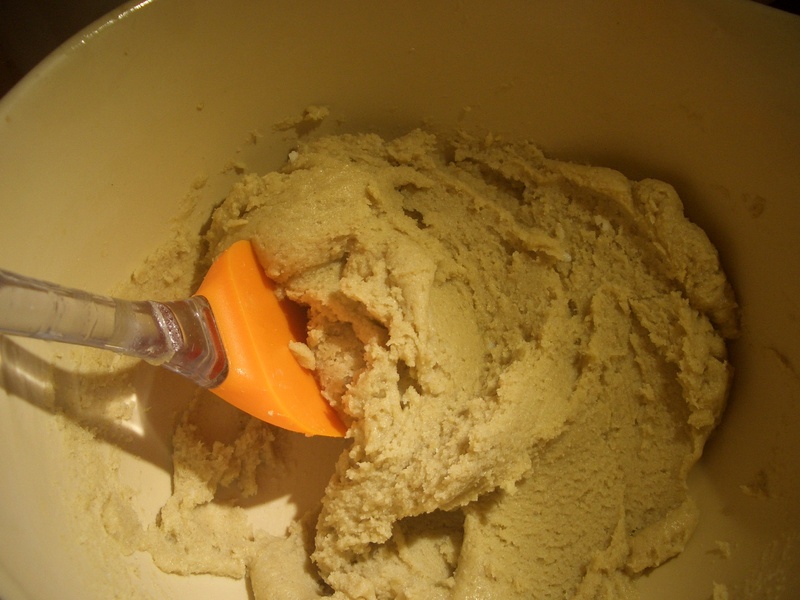 It blended into the other ingredients much better than the coconut oil had…if you look closely at the old photos you’ll see little white spots in the dough – that’s the unblended coconut oil. This dough has none of that. 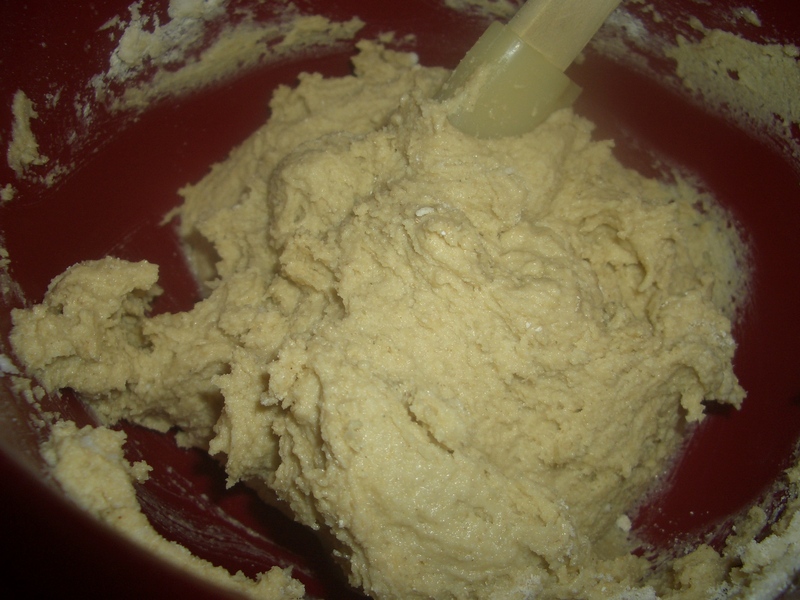 However, the dough came out much softer than the one made with coconut oil. 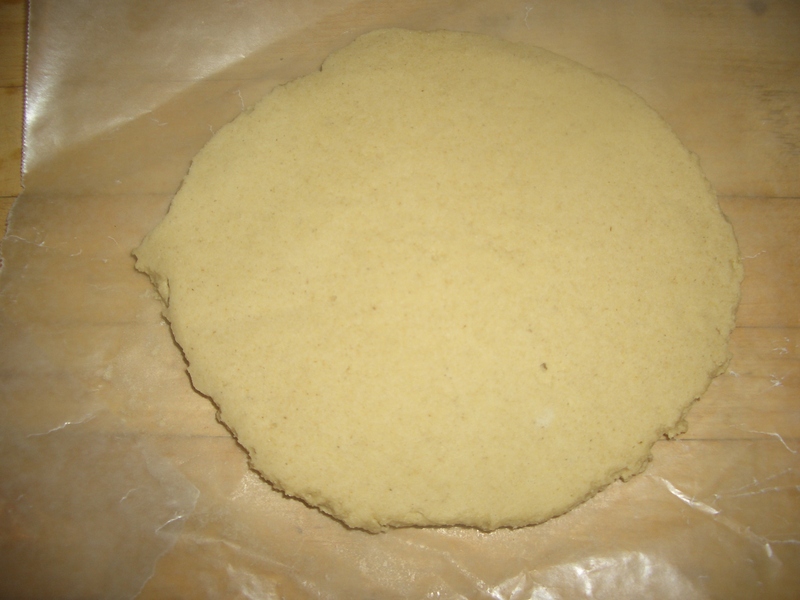 In practical terms that means when you divide the dough in half and pat it into a disk, you have to cover the dough with a second piece of wax paper and pat the wax paper to make the disk, then refrigerate at least 1 hour until dough firms up. 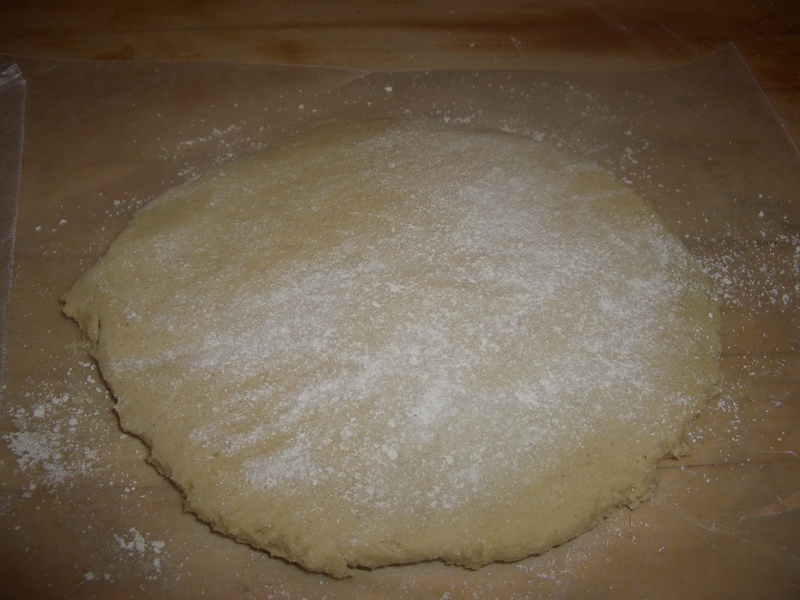 To roll the dough: dust the disk with oat flour then spread it all over; place between 2 pieces of wax paper and roll it out. The end result was very very good and worth the extra effort. 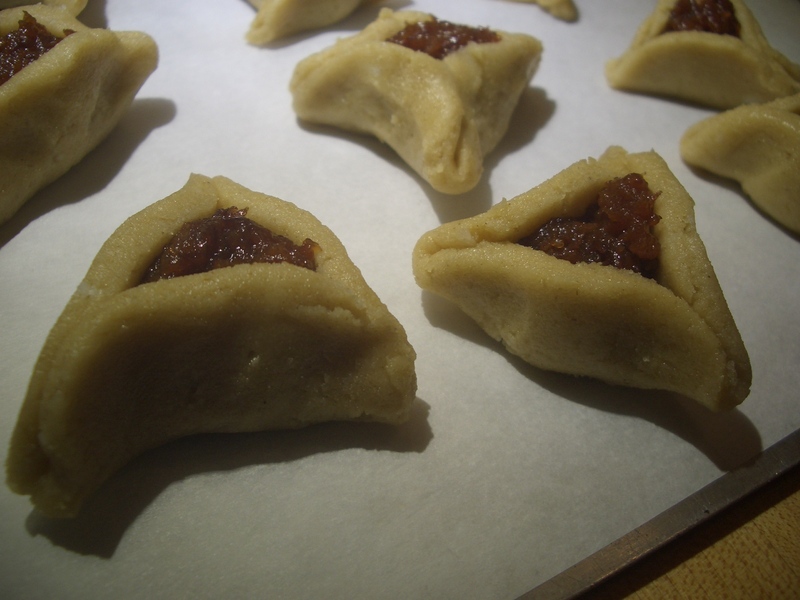 These are mini hamantashen, you can use a bigger biscuit cutter to make normal sized cookies, you’ll just end up with fewer. The recipe from last year follows. 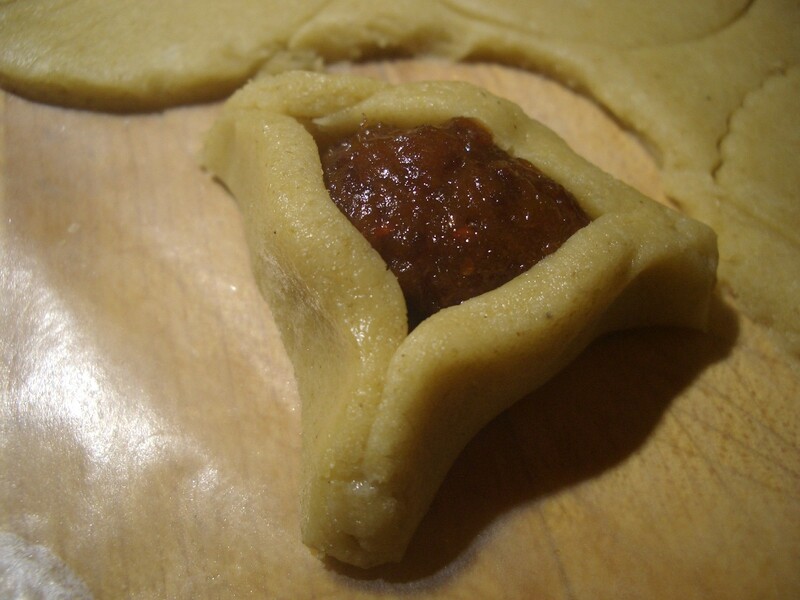 Everyone likes different fillings for their hamantashen. 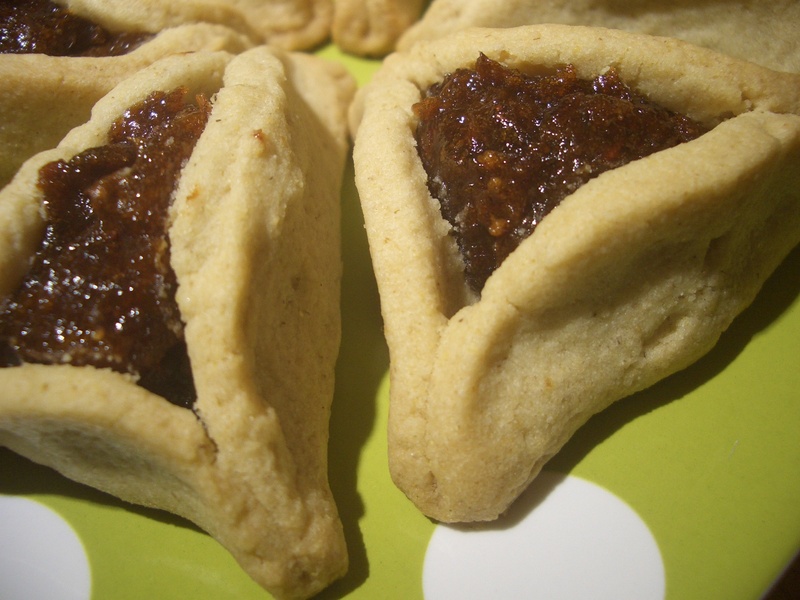 The most traditional ones are prune or apricot lekvar (a thick jam made from dried fruit) or poppyseed pie filling. More modern fillings include raspberry, chocolate, and peanut butter. Use whatever strikes your fancy. 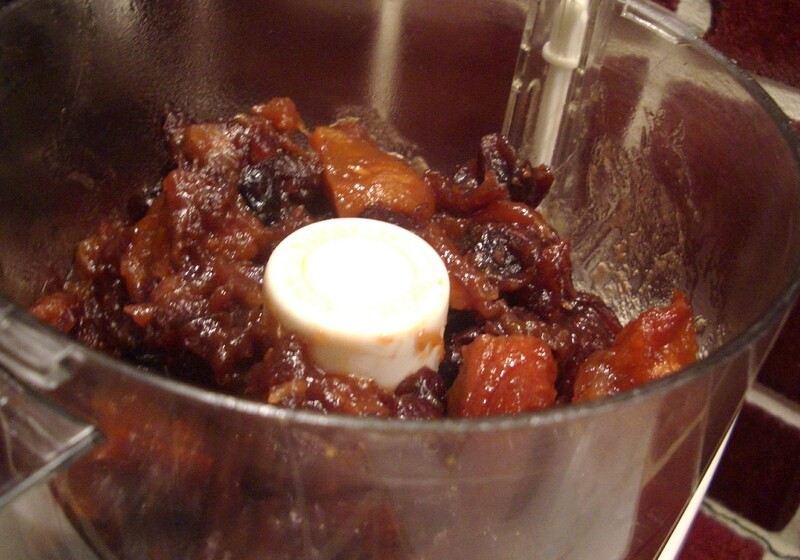 I used dried cranberries, dates, and peaches – the recipe follows. 1. 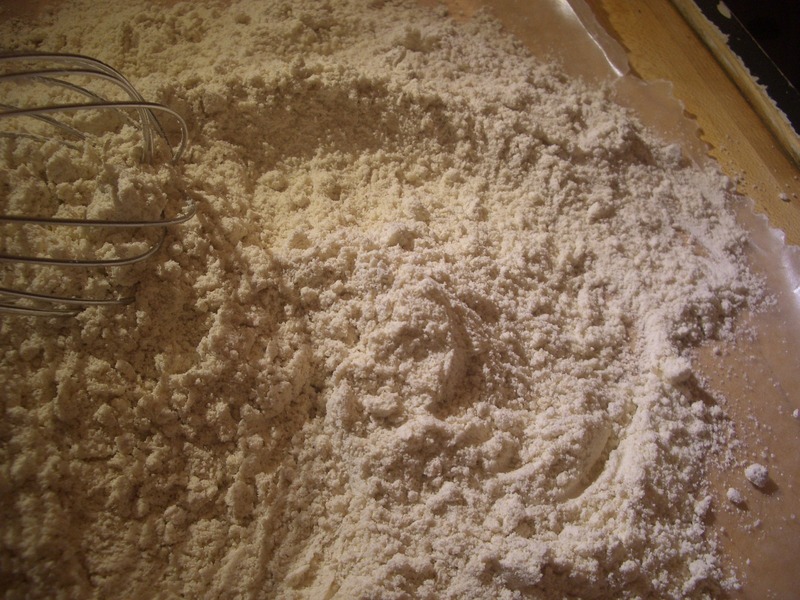 In a medium bowl or on a piece of waxed paper, stir together both of the flours and salt. 2. In a large bowl, cream the coconut oil with the sugar. Beat in the egg, and milk. 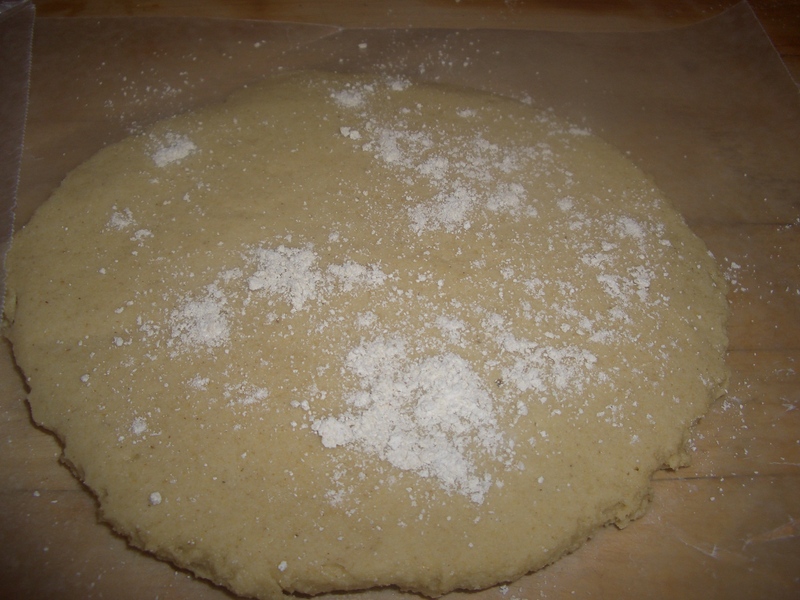 Beat in the flour mixture. 3. 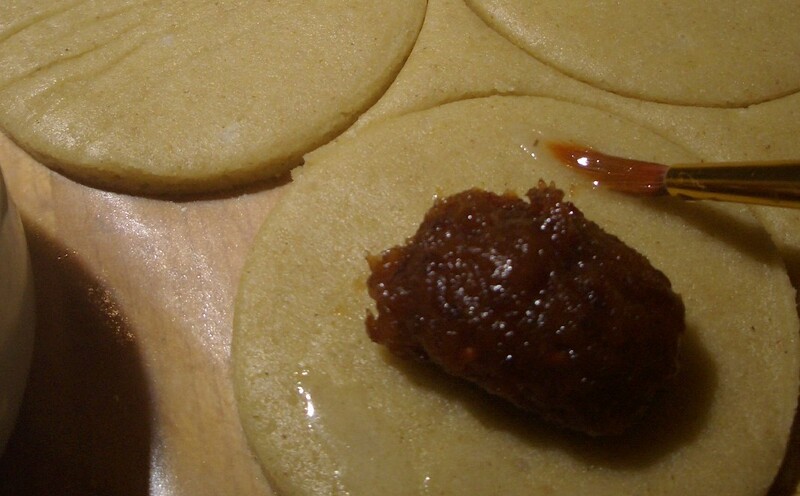 Flatten dough into two disks; cover with wax paper and chill until firm, about 1 hour or until fairly firm. 4. Preheat oven to 325°F. 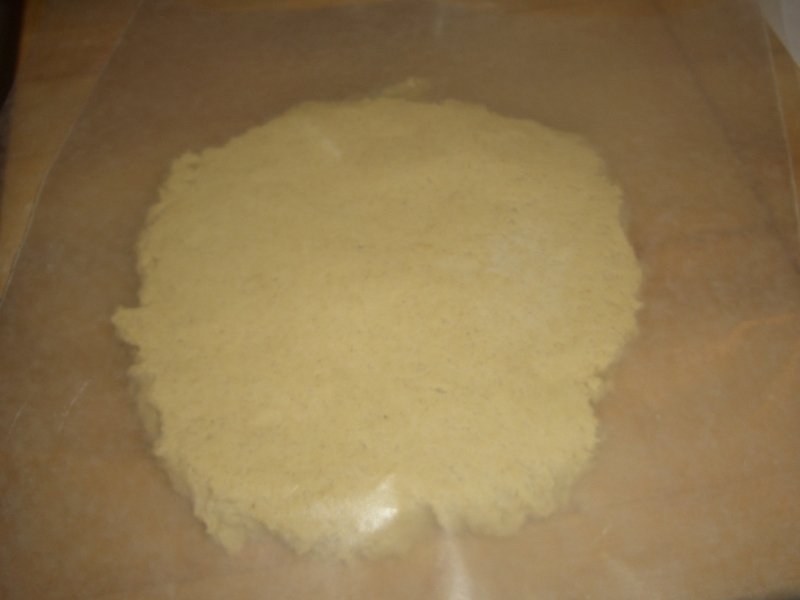 Grease 2 large cookie sheets or line with parchment paper. 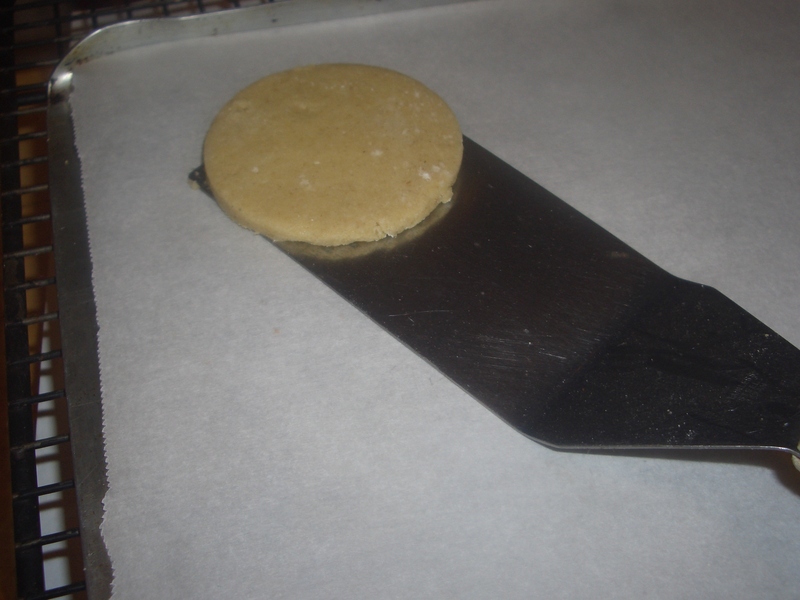 Roll 1 of the chilled dough disks, between 2 pieces of waxed paper, until it’s about 1/4-inch thick; using new sheets of waxed paper when the old ones gets wrinkled. 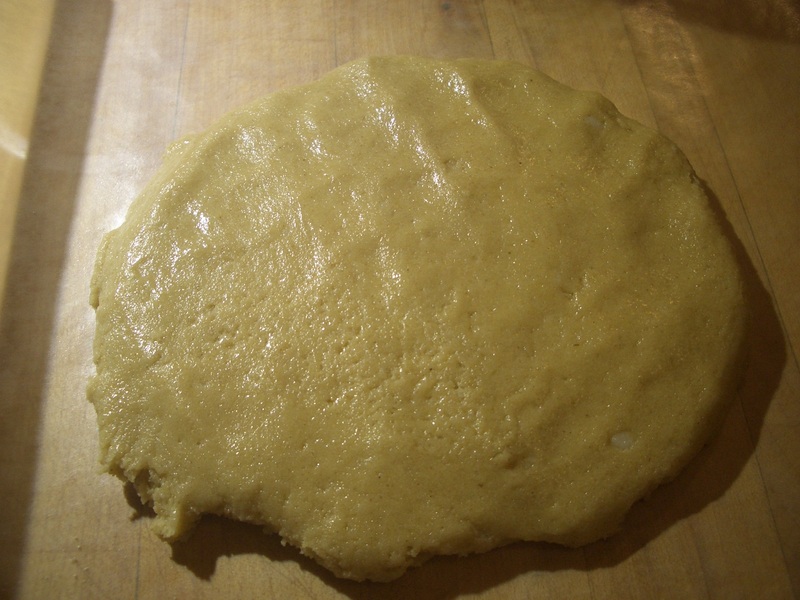 Using a 2-inch round cookie cutter, cut the dough into circles. 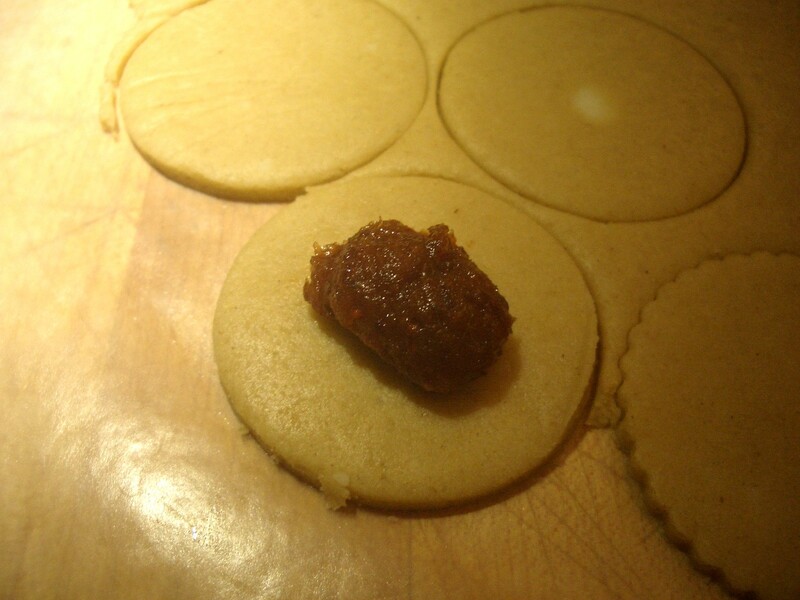 Place 1 teaspoon of the filling in the center of each cookie. 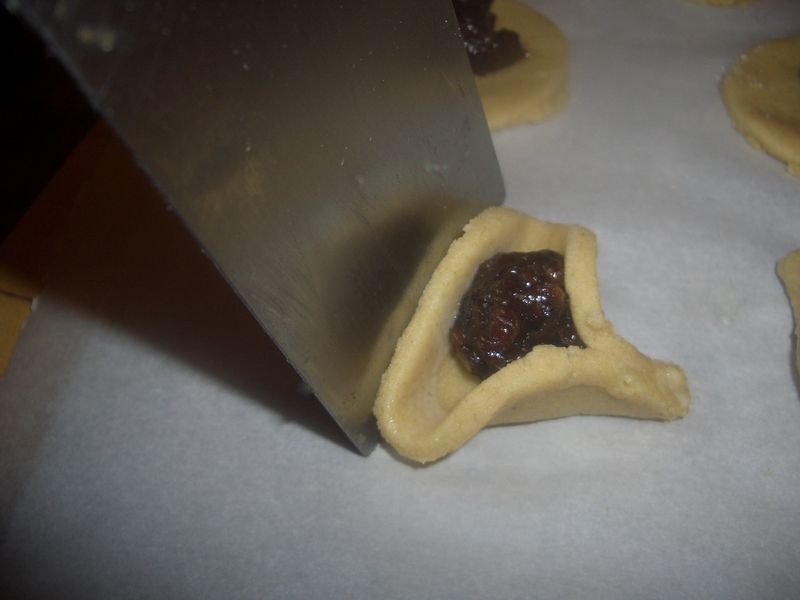 Lift the sides of the dough so that it forms a triangle where the filling shows through the center; pinch the edges of the dough to seal. 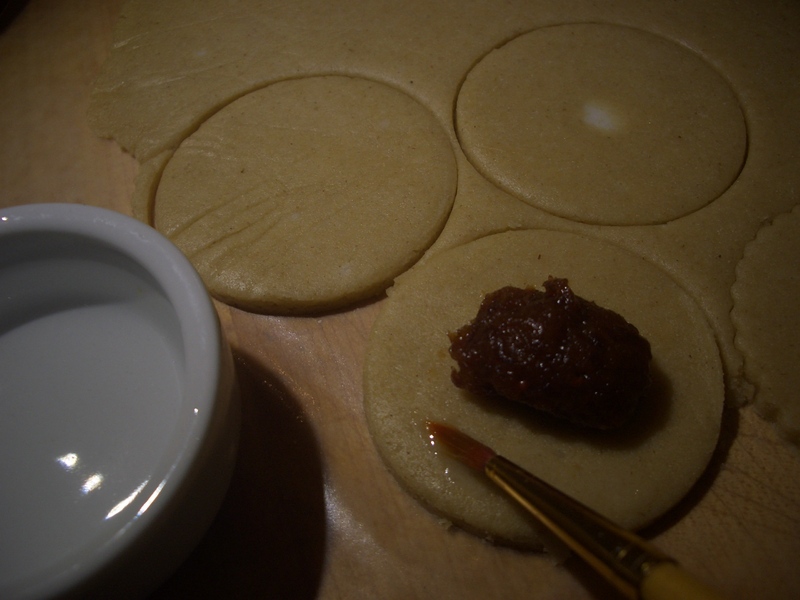 Place on greased cookie sheets (or lined with parchment paper). 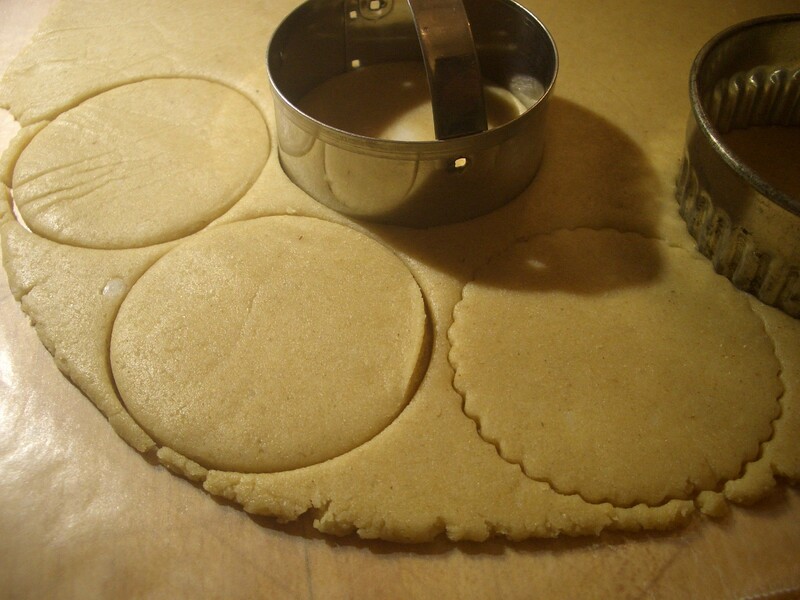 Reroll any dough which was left after cutting out the circles; cut out additional circles to make cookies. Fill and fold as described. Repeat with remaining chilled dough. 5. Bake 20 to 25 minutes or until lightly browned on bottom. 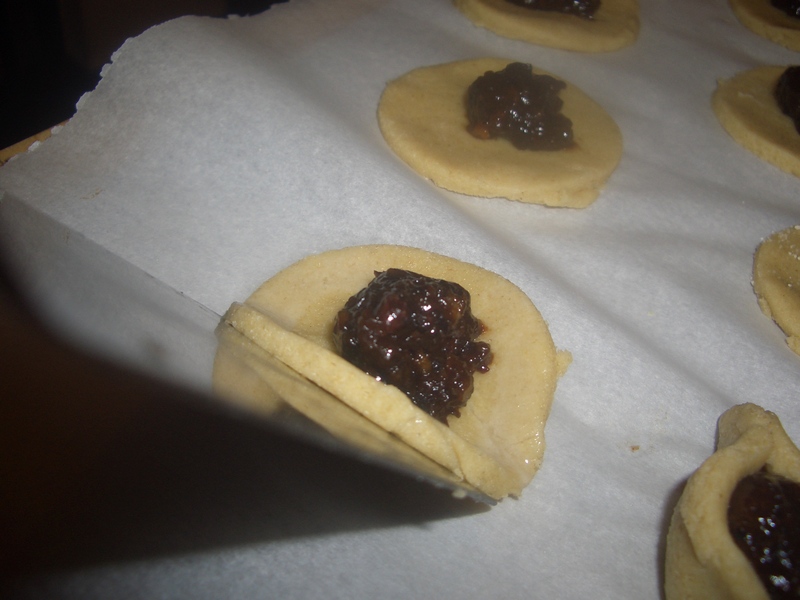 Any dried fruits are good for this filling. I tend to use the ones I’ve bought and never got around to using. If you think the filling is too sweet (this one isn’t because of all the cranberries), just add a little lemon juice until it tastes right to you. 1. 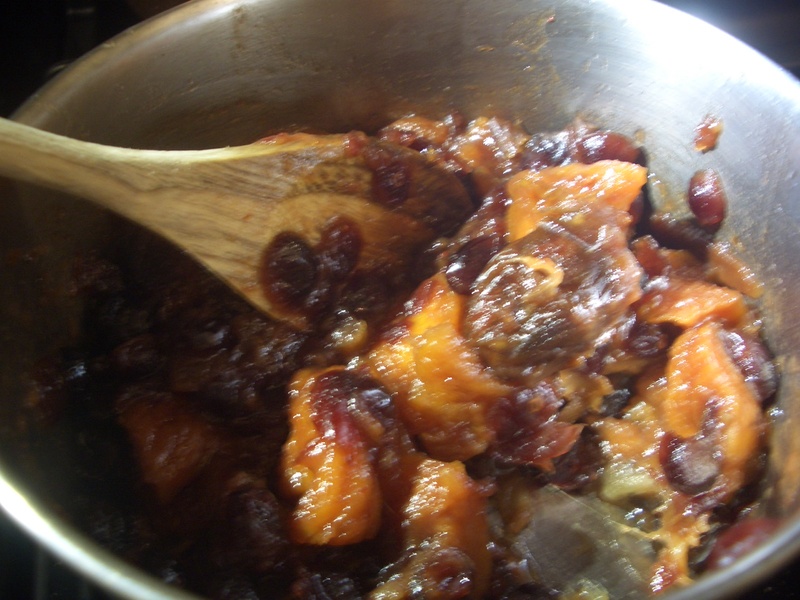 In a 1-quart saucepan, combine the dried fruits. Add the water and sugar and stir. Bring to a boil over high heat. Reduce heat and simmer, uncovered, 20 minutes or until the fruits are soft and most of the liquid has evaporated. 3. 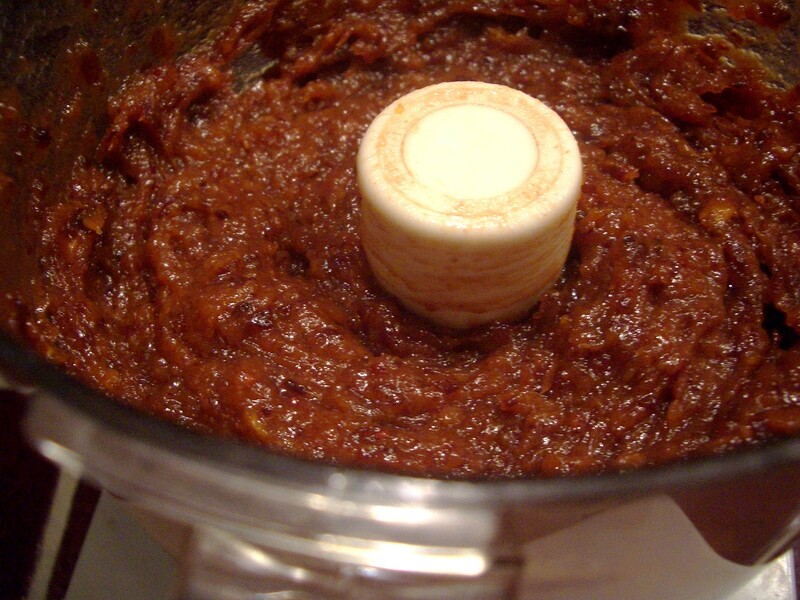 Transfer contents of pot to food processor. 4. Cover and process until smooth.